Madhya Pradesh Vigyan Sabha has organized a mega program in the premises of Choutram International School, Sirpur Talab, Dhar Road, Indore between 7.00 AM to 10.00 AM in occasion of ‘Ragiri Diwas’. 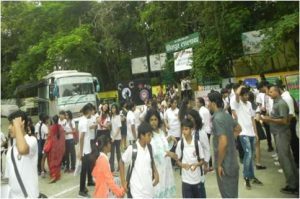 Around 650 students from various schools of Indore and their parents were assembled in the Choutram International School premises. District Administration, Regional Public Relation Office, Nagar Nigam and Atal Transport Limited were also supported and involved in this program. 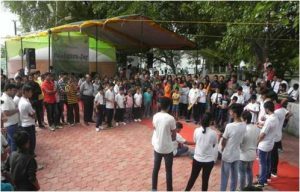 Mr. Rajendra Singh of Childrens Science Centre, Indore and Mr. Ashish Pare, Dr. Neha Shamnani, were conducted the program as resource persons. As usual the resource persons addressed the audience through lectures and distributed Pamphlets, brochures etc for detailed information regarding the importance of E-waste management. Mr. Madukar Pawar, Asst. Director, Regional Public Relation Officer, provided details of E-waste management and the need of its safe disposal. 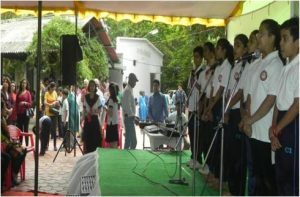 An exhibition of E-waste management and environment protection also organized in the premises. 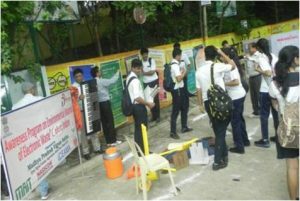 Mr.Singh has explained to the students about exhibition prepared on E-waste management in Bus ‘Transit Exhibition on Bus’ and tried to clear their doubts regarding E-waste and its management. 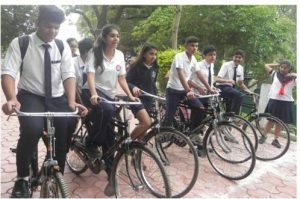 A cycle rally of students also been organized in this occasion with slogans of Environment protection, Pollution Control and E-waste management. The program has received wide publicity in local news papers as well as common people.